Our homeschool students are well trained, well socialized, and well prepared for college… but what if spending a fortune and four years isn’t what they want to do? Apprenticeship may be the answer! In the last several years, this has become a viable alternative to college. In fact, for homeschoolers across the country this is becoming a fast growing replacement for a college education. An apprentice can be anyone ages 7 to 22 that spends time (alot or a little) formally or informally with someone who is a master trade person. That person mentors them and teaches them the skills they need to successfully administer a specified task. Yet, throughout is the underlying theme of vocational training. Some refer to this as an internship, or work study program while others call it an apprenticeship. Whatever your take, the ETA’s article on Strengthening our Nation’s Workforce says, “With the combination of on-the-job learning, related instruction, and mentoring, the apprenticeship model is a potent tool for addressing the skill shortages that many industries face. It also provides the grounded expertise and knowledge individuals need to do their jobs well and advance in their careers. This idea of apprenticeship is actually quite ancient going back to the time of Hammurabi. The requirement of the skilled craftsmen to teach the youth was actually part of the Hammurabi Code. Consequently, apprenticeship in America has been around since the first white settlers arrived. They brought with them the European custom of indenture. This simply referred to the copies of the apprenticeship contract. An indenture or tear was made in both copies by placing them upon each other. In this light one could verify that these were indeed copies of each other. In fact, many men found their way to America by indenturing themselves and thus causing their “master” to pay for their travel needs in exchange for a contracted time of apprenticeship. Often the master was bound by contract to feed, clothe, and house their apprentice. One of America’s most famous craftsmen was Paul Revere. He learned his trade in the same manner that a modern apprentice would today. Just look around there are modern day examples of apprentices everywhere. Yet, today’s apprentice has it far more easy. They are paid, live in their own home, and usually receive some sort of document at the close of their apprenticeship that gives them credentials for work elsewhere. Though apprenticeship was a historical idea, there were many that mistreated those who were apprenticed. In 1937, America passed the Fitzgerald Act which protected those who were in an apprenticeship agreement. Today, as you enter into your apprenticeship make sure that you work out all nuances of the arrangement prior to starting. It is also important that students apprentice to an employer that is working with the Federal Office of Apprenticeships. When the apprentice completes his training he will receive a recognized certificate from this program. It is difficult for employers to accept apprenticeship training without some type of standard certification. Here are some basic requirements of this type of apprenticeship. This method of apprenticeship is designed to protect the apprentice. However, an apprenticeship does not have to be registered to be legitimate. In fact, in a survey by the Associated General Contractors of America, 90% of top officials in construction companies in America were shown to have been apprenticed. For young people who don’t feel that college is their calling, an apprenticeship can be a viable and expedient method to entering the career path they have chosen. 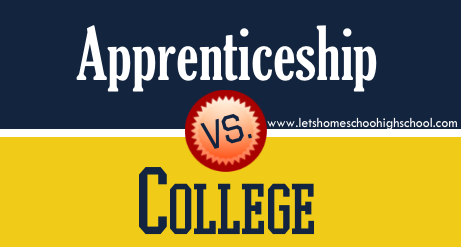 For many, the apprenticeship offers a salary while college tuition offers debt. In addition, the apprenticeship can be a vital avenue to developing a strong character. Homeschool parents have worked hard to develop a good work ethic in their children, and apprenticeship can further cement this through real life experience. The apprenticeship can also reinforce or alter a career choice. Getting to “test drive” the career path is a great way to see if it is a good fit. For some students, it has been a way to discover that they really did not enjoy that particular area of work. The apprenticeship can also be completed along with college training. Using an apprenticeship in conjunction with college education can be a great way to “put feet on” the knowledge that is gained in the classroom. When Should we Begin an Apprenticeship? Beginning an apprenticeship shouldn’t be taken lightly. The homeschool student should be mature enough to be trusted with great responsibility. They should be prepared to follow instructions and handle tasks in a mature way without much supervision. When considering an apprenticeship for a young student, adults will need to make the rules and boundaries clear as well as the expectations prior to beginning. It is also a good idea to check out the child labor laws in your state. The parents will need to work closely with the Master the student is apprenticed with. Close communication will help reinforce the skills being taught. The decision to begin an apprenticeship and at what age will depend solely on the student, the parents, and the master with which they will apprentice. Begin with family members that may have the skills your student is interested in. If you can engage a family member to apprentice you can start early. An apprenticeship can be simply teaching your children skills that you have acquired. Think about your friends as well. Is there someone that you know that is skilled in the area your child is interested in? Explore the possibilities of establishing an apprenticeship with them.